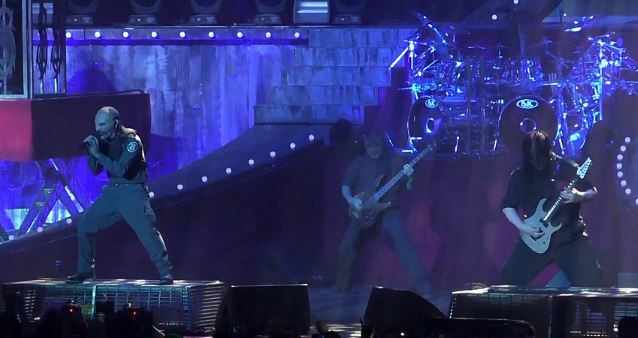 Multi-camera fan-filmed video footage of SLIPKNOT performing the song "Sarcastrophe" on February 8 in Hamburg, Germany can be seen below. SLIPKNOT's "Summer's Last Stand" tour kicks off on July 24 in West Palm Beach, Florida, wrapping up six weeks later on September 5 in Dallas. Joining SLIPKNOT on the road trip will be LAMB OF GOD, BULLET FOR MY VALENTINE and MOTIONLESS IN WHITE. The last single released from SLIPKNOT's new album, ".5: The Gray Chapter", which came out in October, was called "Custer". ".5: The Gray Chapter" is the first new SLIPKNOT record since the 2010 death of bassist Paul Gray and the 2013 dismissal of drummer Joey Jordison.